Designing new country comforts atop Muskoka granite. 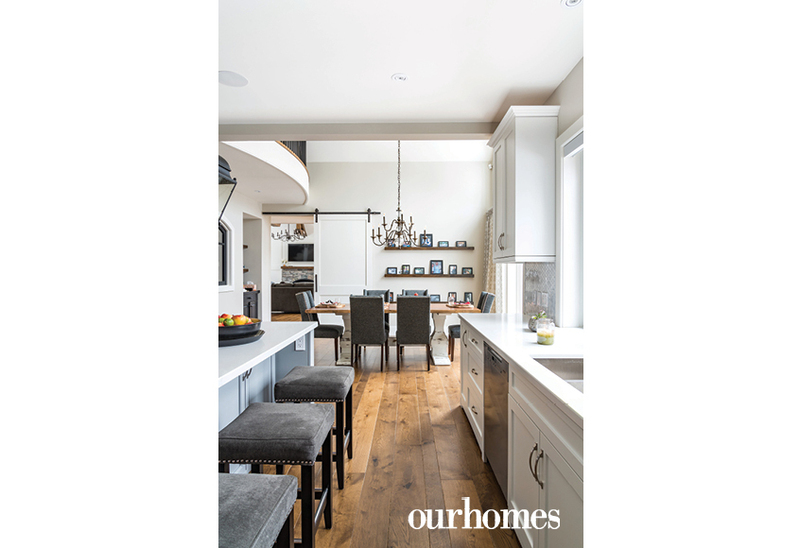 A version of this article originally appeared in the Early Summer 2018 issue of OUR HOMES Parry Sound Muskoka Huntsville Haliburton, p.36. Find local businesses in our Muskoka directory. Laurie and Mark Murray had always liked Huntsville and Deerhurst Resort where they’d bring their four children for week-long holidays. 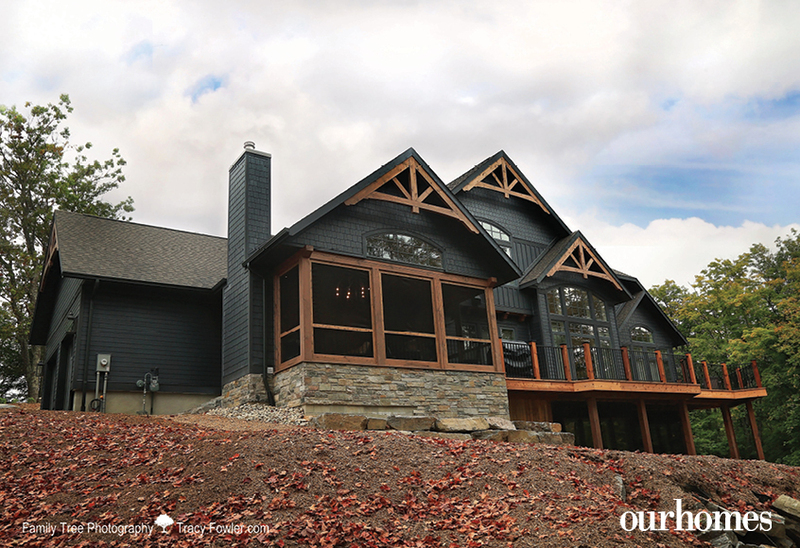 When Deerhurst held a lottery for cottage lots, Mark won the chance to buy a property where they could build a home of their own design. But they had to go back to the drawing board when they learned what the rock work for their new cottage would cost. They began planning anew with builder Peter Smith, owner of Peter Smith Construction, whom they met at a cottage show in Toronto. Smith redesigned the house with the front entrance on the north side of the home, a move that significantly cut excavation costs. Smith helped revise their design to suit the shape of the lot and the couple worked with Jennifer Pink of Design Interiors to make the countless detailed decisions about the project. As envisioned, the panelled great room, painted in Benjamin Moore’s Sea Salt from Wilson’s The Paint Store, overlooks the golf course through high windows that catch the sunrise and sunset. Thick wooden arches intersect the cathedral ceiling and a stone-faced fireplace by The Fireplace King invites gatherings at the room’s centre. 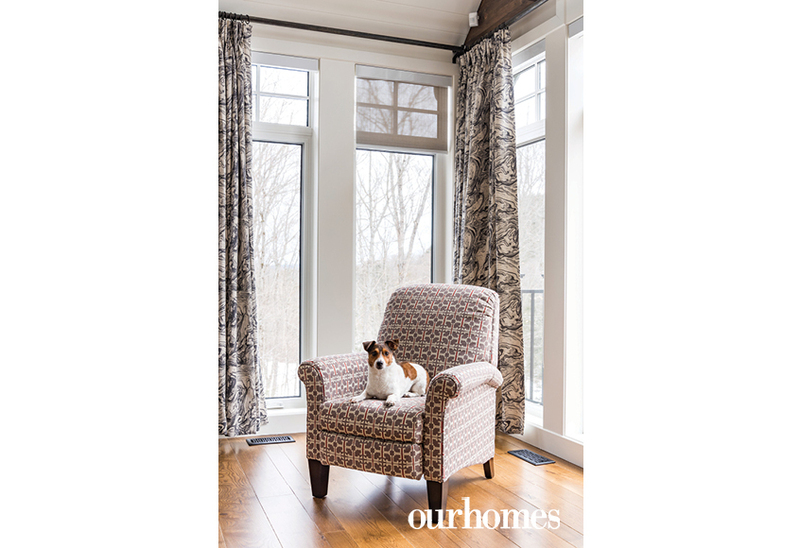 Window Quilt Muskoka supplied window shades throughout the home. In the kitchen, Di Pietra Design supplied and installed Caesarstone counters in a light, subtly-patterned design called Calacatta Nuvo. A second-floor balcony provides a birds-eye view of the dining room and the forest outside. The upper floor contains three bedrooms, including the master bedroom with its en suite and walk-in closet. Builders installed a pocket door to make more room for the shower and extended an exterior wall to create space for a tub. Thermo Seal Insulation Systems, specialists in blown-in fibreglass insulation, ensured the house stays warm in winter and cool throughout the sultry summer days. 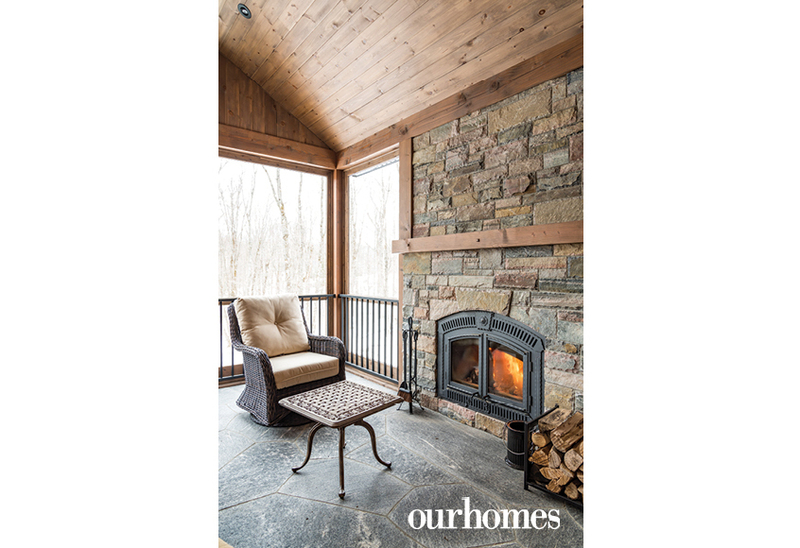 Burning wood takes the chill off the screened Muskoka room with flagstone floor in this new Deerhurst home. PHOTO: TRACY FOWLER. // The south-facing exterior deck and Muskoka room catch the sun’s afternoon warmth. 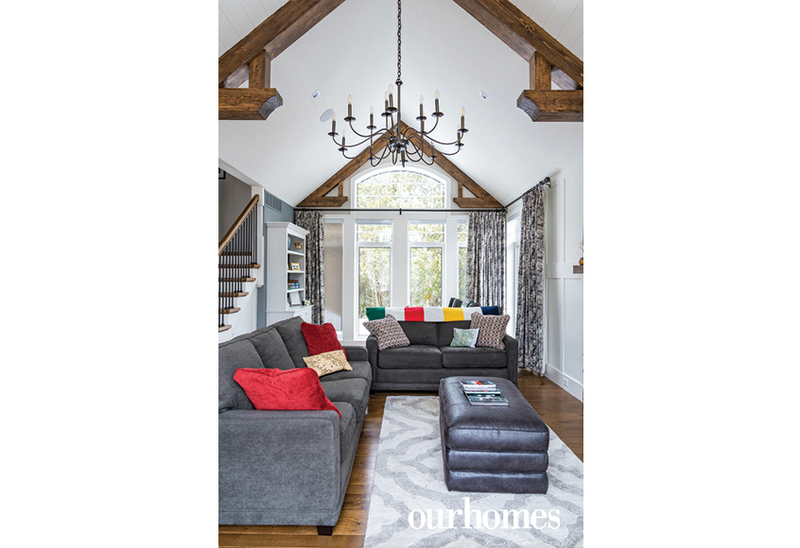 Decorative beams are integral to the design. Just inside the home’s main entrance, a floor of wire-sawn, flamed flagstone, installed by Nate Gill and Carson Fowler from Rock Solid Masonry, exudes solidity. 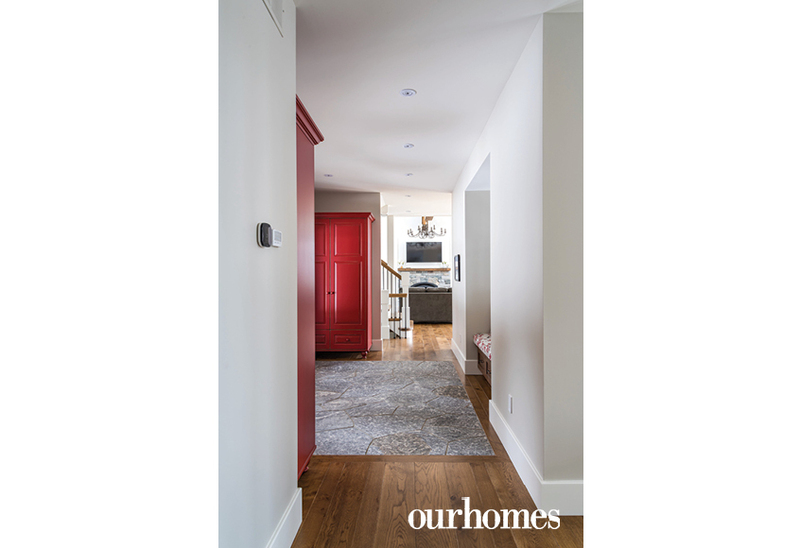 Matching red wardrobes flank the flagstone floor at the home’s front entrance. 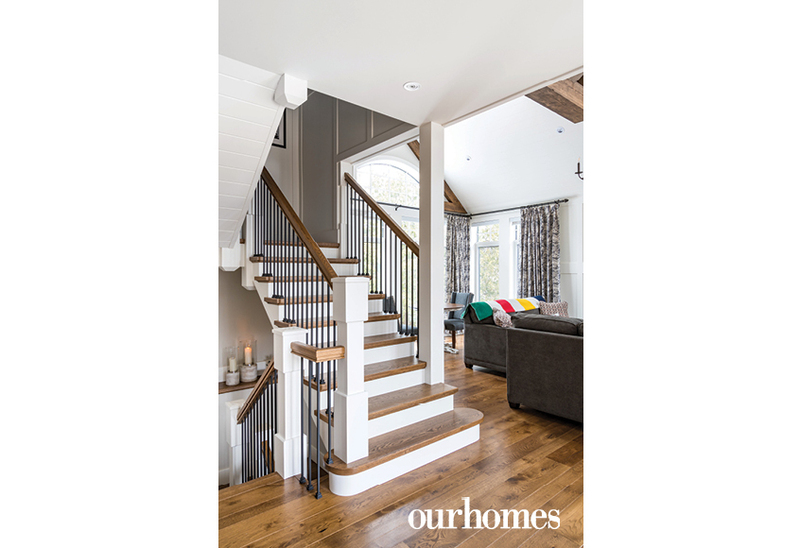 A central stairway with oak treads accesses all three levels of the cottage. White panelled walls surround the stairwell. A unique combination of wooden ceiling arches, hand-forged chandeliers and custom-made drapes creates comfort in the great room. 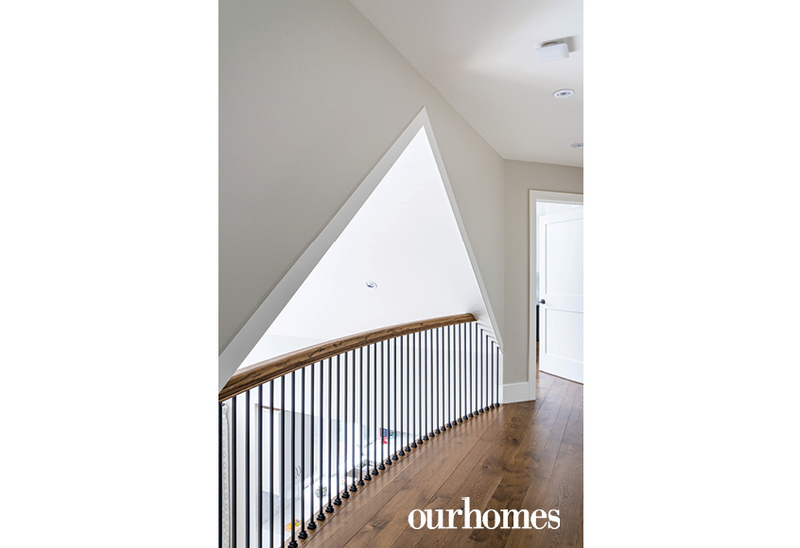 Oak hardwood sheaths floors throughout the home’s main living area and bedrooms. 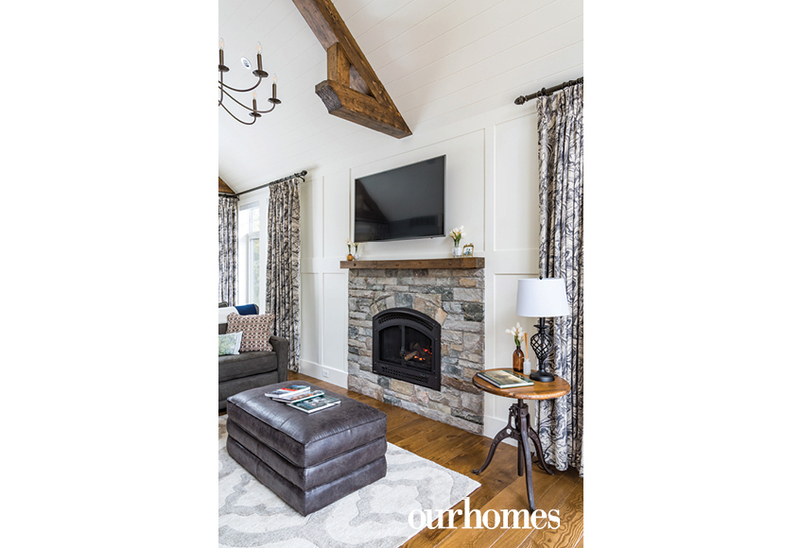 The great room fireplace, flanked by panelled walls, creates an inviting place for family gatherings. Just visiting, Cooper, a vigilant Jack Russell terrier, makes himself at home. 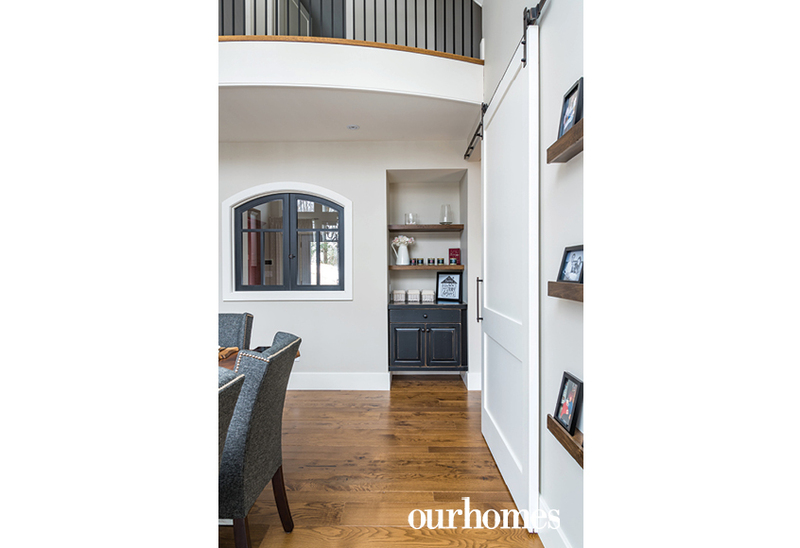 A sliding barn door opens from the great room into the dining room. A live-edge, black walnut table furnishes the dining room. High arched windows overlook the wooded south side of the property while family photos are displayed in three tiers. Living Wood Design created the live-edge wooden placemats. Hanging lanterns with Edison bulbs illuminate the large food preparation area, topped with Caesarstone. The owner uses a six-burner gas stove with a grill and two ovens in this kitchen. 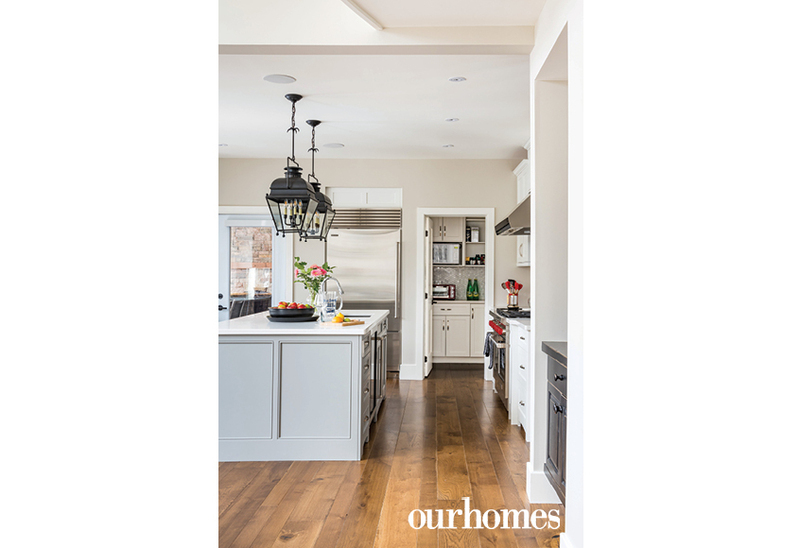 Smith Construction enhanced the kitchen with a pantry built in a space originally planned as a storage closet. Smith also built a pocket to recess the refrigerator. 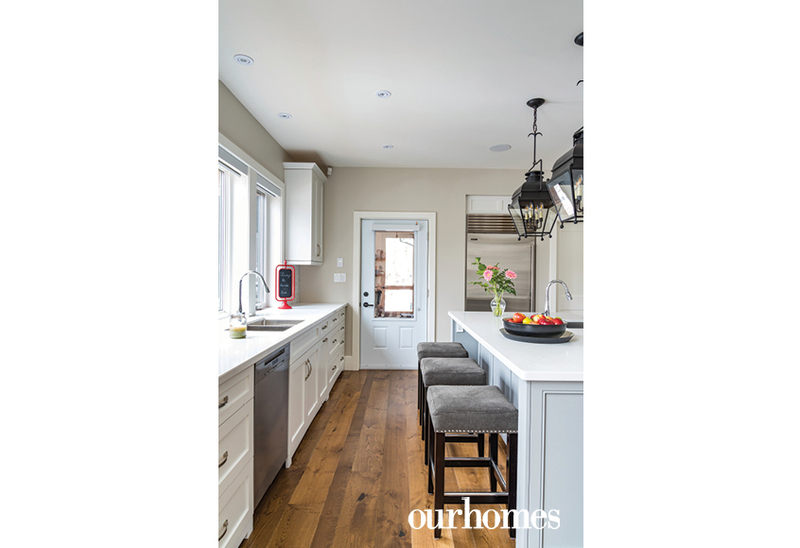 Stools at the kitchen island provide spectator space for meal preparations. In a corner of the kitchen, a door leads to the Muskoka room. A cushioned bench and windows that open to the dining room await visitors at the entrance of the Murray family cottage. 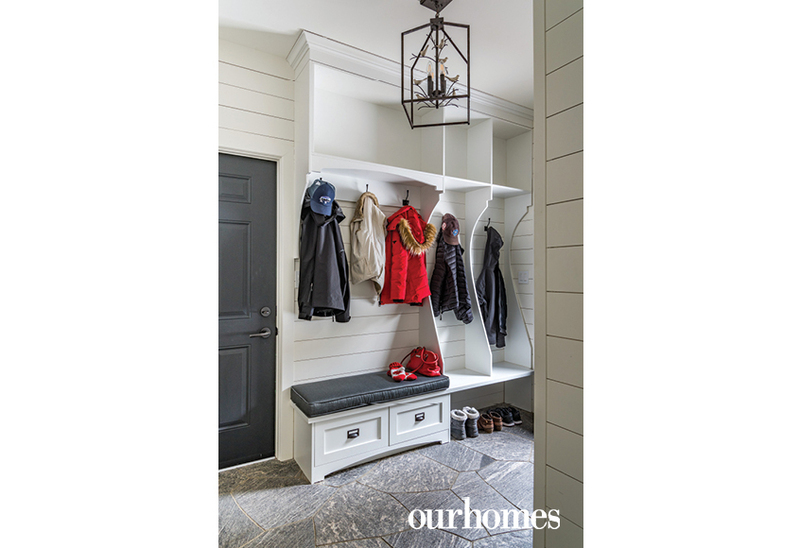 The flagstone floor provides a durable and easy-to-clean entrance in the mudroom. 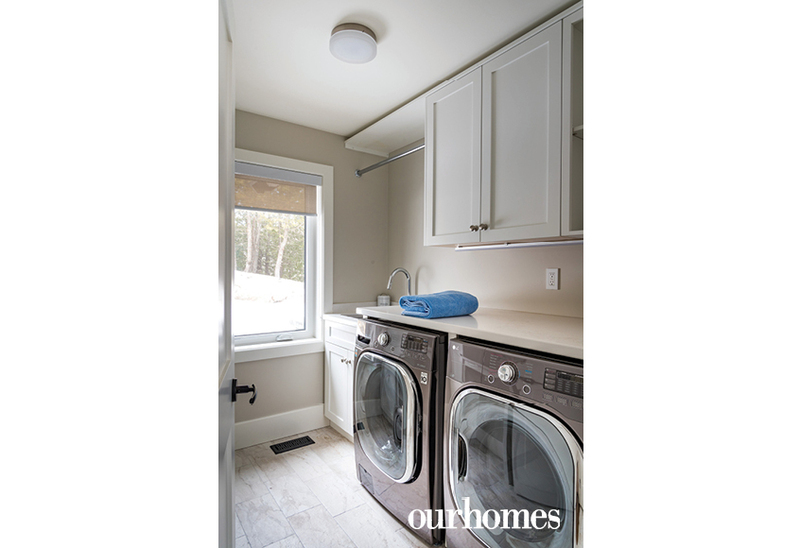 A front loading washer and dryer equip the laundry room. Upstairs, a subtly curved floor creates a balcony over the main floor living space. A small, plush moose relaxes in the master bedroom where large windows reveal a high panoramic view of the surrounding forest.